It is 13th February 1942, the Japanese troops which have stormed through Malaya have invaded Singapore. Approaching Singapore City from the west, a seasoned Japanese army is forced to engage the small force of the Malay Regiment on the high ground of Pasir Panjang Ridge. A fierce battle ensues amidst the confusion from the aerial bombardement, burning fuel, loss of communications and the early deaths of senior officers trying to keep their men coordinated. The soldiers of the Malay Regiment battle on for nearly two days and a company is wiped almost to the last man by the numerically superior Japanese on the eve of Chinese New Year. The next day, on 15th of February, 1942, General Percival marches down Bukit Timah Road to surrender to General Yamashita of the Japanese Imperial Army at the Ford Factory. The National University of Singapore is built on parts of old battle ground and still contains a WWII military outpost that strategically oversees Jurong, Bukit Timah and Singapore City. In 1954, the ridge was renamed 'Kent Ridge,' and the old stone marker commemorating this event can still be seen today. The accounts of the battle on Kent Ridge left a strong impression on the Pasir Panjang Heritage Guides, and thus we commemorate the Malay Regiment's defense of the ridge every year. We will share with you stories about the Battle of Pasir Panjang, the geography, history and the flora and fauna of the area that first drew us to explore the ridge decades ago and how the ridge got its name. 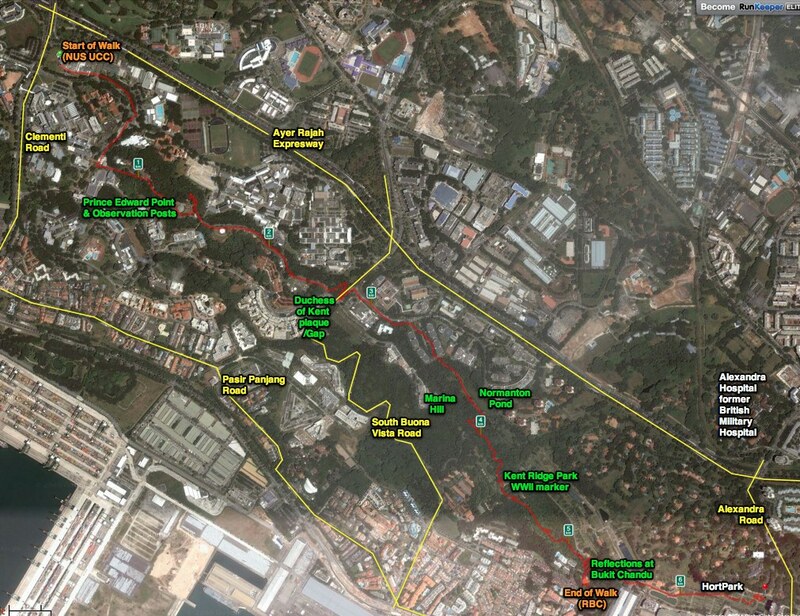 Our route takes us through the National University of Singapore, Kent Ridge Road, The Gap and Kent Ridge Park. We end at Reflections of Bukit Chandu, which is managed by the National Heritage Board. Everyone is welcome if you can wake up early enough and are physically fit enough to walk some 5km at a moderately quick pace and climb some stairs. Please register so we have an idea of numbers, your contact and emergency contact and are able to contact you about last minute updates. This is a five hour walk and it can be hot in parts so please bring at least one litre of water and some sandwiches or snacks. It can always rain so do bring an umbrella too! "Fifty people and two dogs on the Battle of Pasir Panjang Commemorative Walk," by N. Sivasothi. Raffles Museum Toddycats, 14 Feb 2011. "Battle of Pasir Panjang Commemorative Walk 2009 Review," by Kenneth Pinto. Raffles Museum Toddycats, 19 Feb 2009. Photos from 2012, 2011, 2010 and 2008. "I invite you and your colleagues to attend this workshop on Climate Change Challenges in Cities. 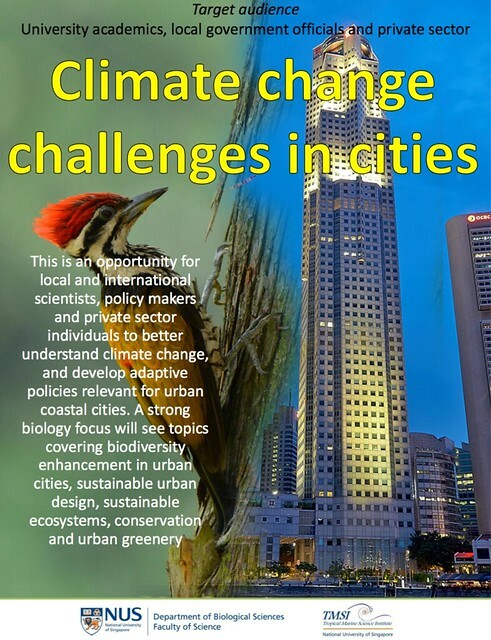 For more information on the programme and speakers, and to register, please go to climatechangechallengescities.wordpress.com. This workshop is free but please register so that we can cater the right amount of food. Please help forward to your colleagues if they are interested in this topic. Thank you and I look forward to seeing you." "The Marine Life and the Impact of Plastics lecture"
International Coastal Cleanup Singapore Coordinator N. Sivasothi aka Otterman will regale the audience with fascinating tales of local marine life in Singapore including recent records and local programmes which help to protect these animals. He will highlight the impact of marine debris and plastics in particular, drawing from a field of scientific research and data from cleanups from around the world. 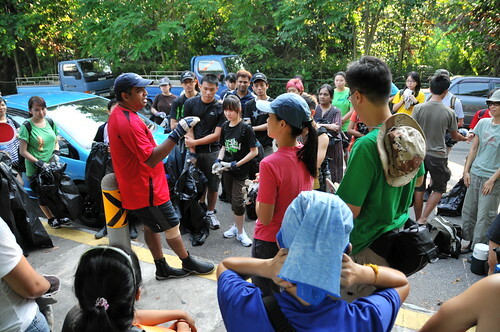 This is the 22nd year of the International Coastal Cleanup in Singapore, and he will discuss what the data tells us. Should we give up? Is the problem insurmountable? Have we made any progress? Hear the discussion about local solutions, methods which have worked at cleanups and at practises at work. 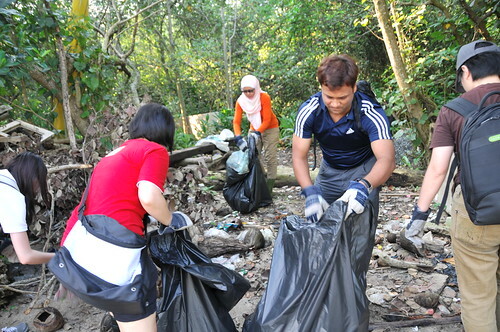 Be a part of national effort to be considerate to the environment and to love Singapore a little more! Lecture Theatre 32 [map], National University of Singapore. Take SBS Bus 95 from Buona Vista MRT. park at Car Park 10 or University Hall, off Lower Kent Ridge Road. 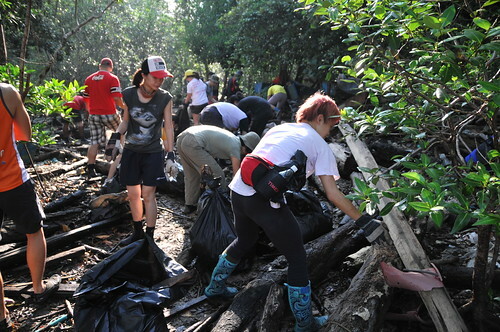 Celebrate our National Day by joining the annual mangrove cleanup at Lim Chu Kang! Lim Chu Kang mangrove is a beautiful and unique patch of unprotected mangrove in Singapore, facing the Western Straits of Johor. 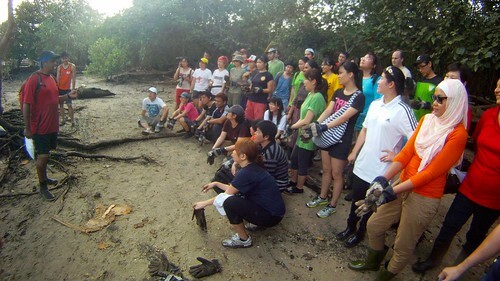 The mangrove has educated decades of students and it holds many stories about animal and plant life and heritage in Singapore. In 2008, it was revealed that the Sungei Buloh Master Plan would include the Lim Chu Kang mangroves. 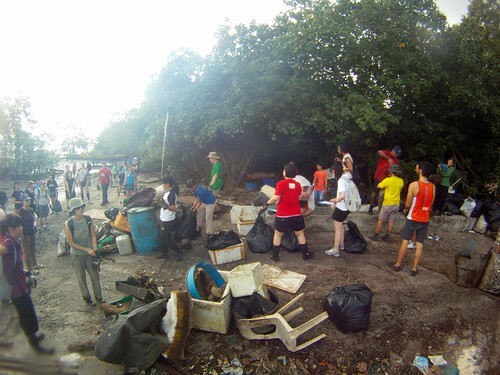 Trash from the Johor Straits deposits on this Lim Chu Kang beach and mangrove regularly and various individuals and groups help to tackle this burden through organised cleanup throughout the year. 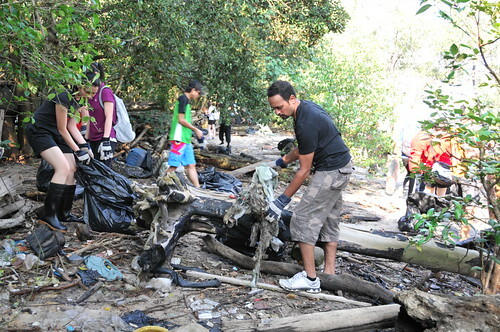 The post-National Day Mangrove Cleanup is an important exercise which helps protect and maintain this precious patch of mangrove. We'll provide gloves and transport, you come with a strong heart and eager hands to do a good job. For details and to sign up, check the announcement on ICCS News. 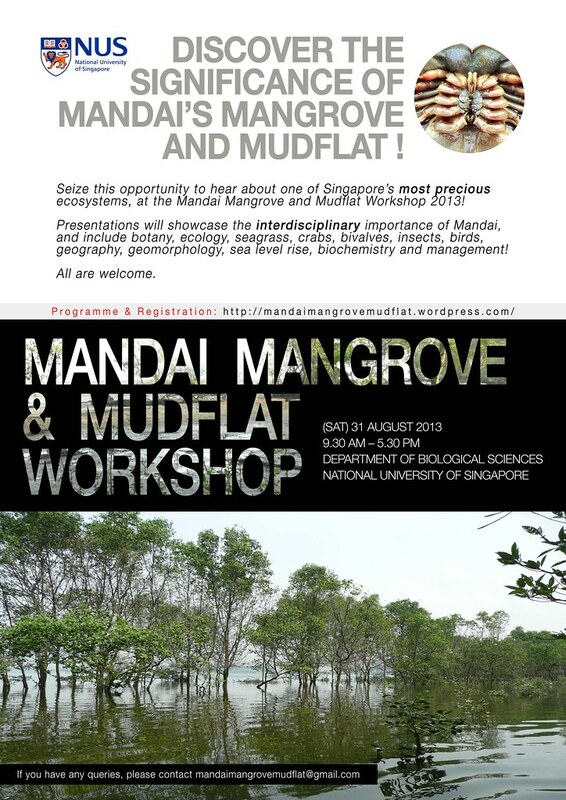 This workshop is being organised to share research highlights from various groups and individuals who have conducted scientific studies at Mandai Mangrove and Mudflat, past and present. Mandai mangrove and mudflat, was the domain of mainly zoological research in the 90's. Since then it had become an area of scientific interest to a wider community of scientists and revealed studies in botany, zoology, ecology, geomorphology, geography and analytical chemistry. The organisers hope this workshop can be a time for the community to share their work, past and present, with scientists, naturalists and anyone concerned about this significant ecosystem in Singapore. 18th July 2013 - since the "Chained To Our Roots" event on 22-23 Jun 2013, a petition has been circulating which you can read and sign if it reflects your views, at tinyurl.com/lta-crl. In January 2013, the Ministry of Transport announced plans for an MRT line called the Cross Island Line (CRL) that will be completed around 2030. Running about 50 km from Changi to the Jurong Industrial Estate, the Cross Island Line will be Singapore’s longest train line. As unveiled, the CRL passes through the southern section of the Central Catchment Nature Reserve (CCNR), near MacRitchie Reservoir, as it goes from Sin Ming to Bukit Timah. The Nature Society (Singapore) (NSS) believes that engineering investigation and construction works for the Cross Island Line will severely degrade ancient, species-rich and highly complex ecosystems. 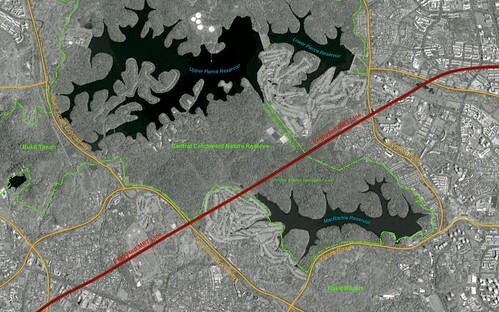 The Nature Society recommends that the design alignment be adjusted to avoid crossing the Reserve. Of particular concern is the fate of primary forest remnants that the Cross Island Line will traverse if built as presented. Less than 0.2% remains of the lowland rainforest that originally covered most of Singapore. The remnants are too scarce and take too long to regenerate to risk damaging them. In addition, the stream systems through which the Cross Island Line passes are especially vulnerable. Though these habitats are currently protected as part of a Nature Reserve, they are nonetheless now threatened unless the Cross Island Line is rerouted. 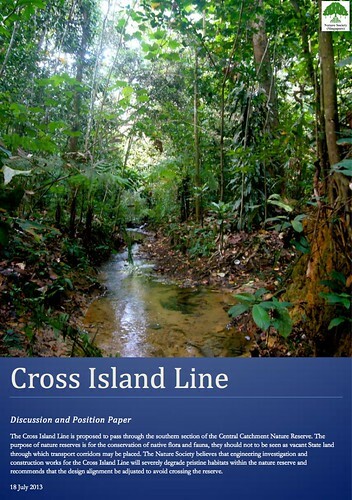 The Nature Society (Singapore)’s Discussion and Position Paper on the Cross Island Line is available from today for downloading from the Society’s website (nss.org.sg). Questions on the NSS Discussion and Position Paper can be directed to crl@nss.org.sg or 6741-2036. The NSS spokesperson for its position on the proposed Cross Island Line is Mr Tony O’Dempsey. Download the full position paper from the NSS webpage. 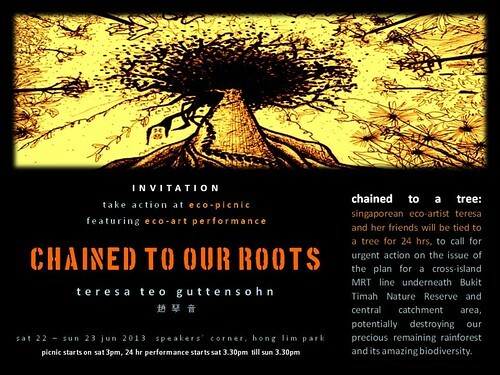 "Chained to Our Roots" by Teresa Teo Guttensohn, is an art protest event with mass chaining to tree web chain to present an appeal LTA to re-route the proposed Cross Island MRT Line (CRL) which would otherwise damage some of our oldest forests in Singapore. The picnic and event will take place on Sat 22 Jun 2013: 3.00pm @ Hong Lim Park and is open to all Singaporeans and PRs only. 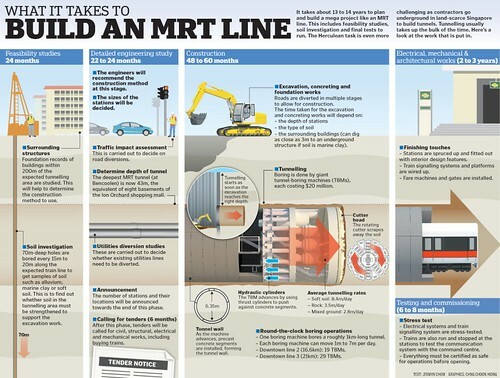 In January this year, LTA announced proposed new MRT lines to be built by 2030. To our considerable shock, scrutiny of the proposed 50km Cross Island Line (CRL) revealed it would cut through the Central Catchment Nature Reserve. No mention was provided of the potential problems of sedimentation, hydrological variation, edge effect and fragmentation. The announcement was a complete surprise to all of us, and gave no indication to Singaporeans of the value of the protected nature reserve it was cutting through. It would seem we need to look no further than our nature reserves, to contend with forest loss. 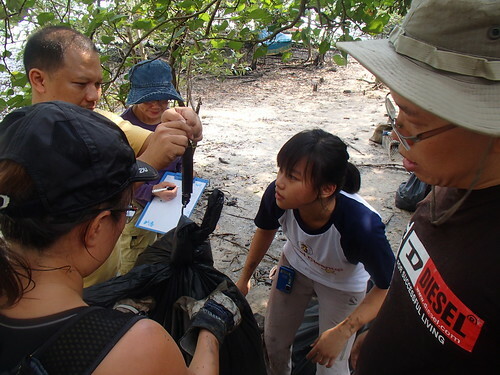 Since then, LTA has initiated a conversation with naturalists in Singapore. But while the CRL remains a proposal to cut through the central catchment, individuals and groups realise realise they have to stand up to address this proposal to promote the realisation of the cost of this action. Teresa Teo Guttensohn is an eco-artist from Singapore who has decided a letter will be an inadequate gesture to communicate the seriousness of this appeal. 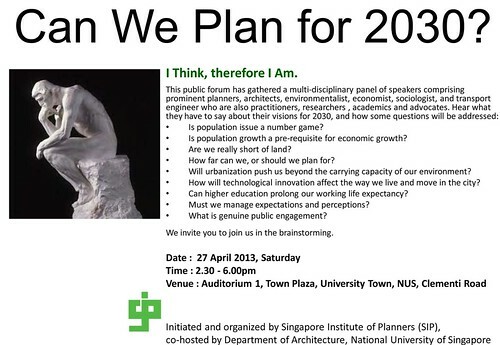 So she has organised an eco-picnic to be held at Hong Lim Park this Saturday 22 June 2013. Everyone is invited to attend and picnic with like-minded friends, and witness the eco-art performance at 3.30pm. Teresa wil be tied to a tree for 24 hours. 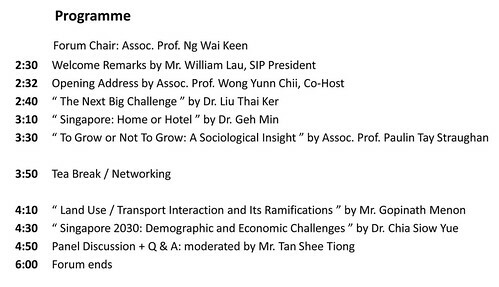 Note that only Singapore Citizens and Singapore Permanent Residents are allowed to attend the event. "If you can't join us on Saturday, and would like to act for our rainforest, please read the link below and sign our online petition to LTA. Together, we can make a difference! Please act now." 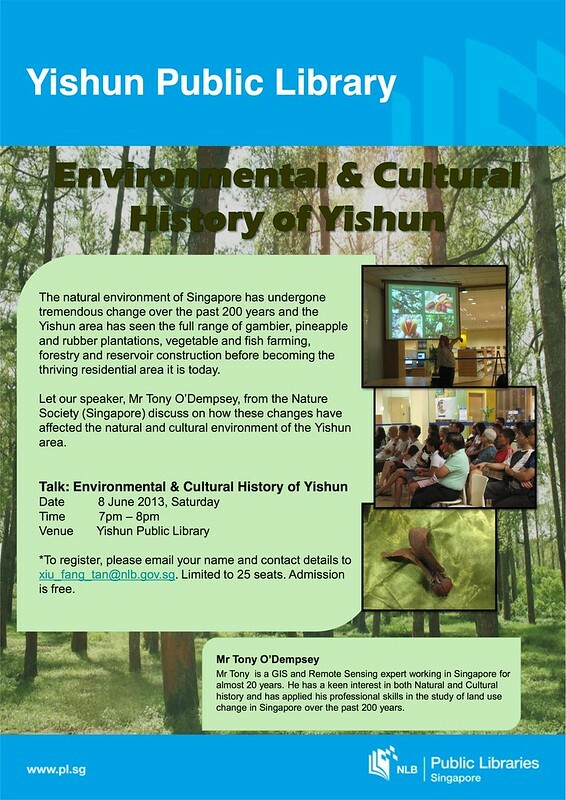 Sat 08 Jun 2013: 7.00pm @ Yishun Public Library - Tony O'Dempsey on the "Environmental & Cultural History of Yishun"
To register, please email your name and contact details to xiu_fang_tan@nlb.gov.sg. Admission is free but this talk is limited to 25 seats. "We note the article '50 km Tampines-Jurong MRT route runs deeper underground: LTA" by Jermyn Chow, The Straits Times, 6th May 2013 (see below). We are gravely concerned that the soil investigation planned for this year will entail the drilling of bore holes every 20 metres along the proposed alignment of the Cross Island MRT through the Central Catchment Nature Reserve. Our concern is that the alignment not only passes through a section of the oldest regrowth forest in Singapore, it also passes through sections of primeval forest as well as a number of rainforest streams. The access roads required for placement of boring machines as well as their operation at 15-20m intervals will cause irreparable damage to the habitat. In particular the native fauna that depend on the swampy stream habitat in the two valleys affected will most likely be permanently lost. 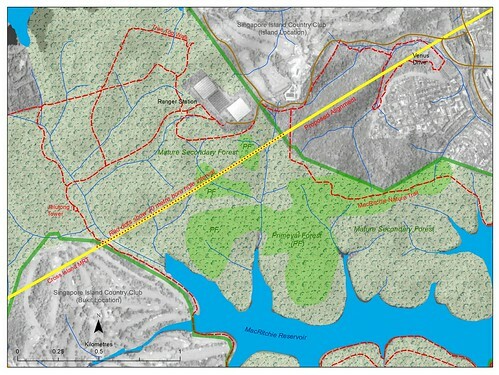 Even though the MRT line is planned to transit the Nature Reserve underground, the soil investigation works will effectively disconnect the primary forest habitat of MacRitchie area from those of the rest of the Central Catchment Nature Reserve. 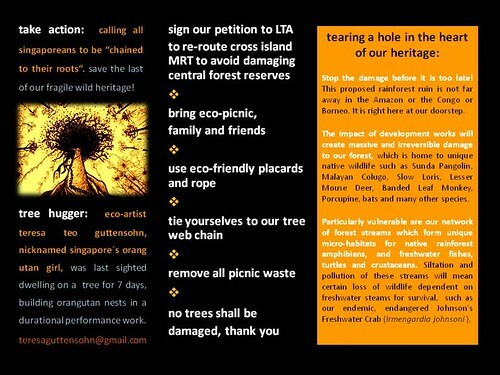 We urge the LTA to redesign the cross island MRT alignment such that it does not intersect the Central Nature reserve. The Map below illustrates the route of the Tampines-Jurong line across the Central Nature reserve as well as the proposed bore hole interval." While the Cross Island Line is expected to be ready only in 2030, studies will start at the end of this year to plan for Singapore's most ambitious MRT project yet. The 50km line runs from Tampines to Jurong, passing through densely built-up areas such as Sin Ming, Hougang, Clementi, and beneath the Bukit Timah Nature Reserve and Central Catchment Area. The LTA is planning well ahead of time because contractors will need to dig deeper underground in land-scarce Singapore for new rail projects. The pace of construction will also depend on the ground's soil profile, which experts say changes every 2 to 3 metres. This makes excavation works all the more challenging as the tunnel-boring machines move through different types of rock and soil, said Ms Choo Chai Foong, LTA's deputy director for design development (rail). Ms Choo, who has been with the LTA for 16 years, said: "As stations get deeper, we must be more careful as there will be more risks and engineering methods need to be adjusted." The LTA will not want a repeat of the tragedy in April 2004, when a deep excavation at a Circle Line worksite collapsed, killing four workers and causing a section of Nicoll Highway to cave in. That delayed the progress of the Circle Line by around two years and consequently, the rollout of lines that were to come after it. But Singapore is not the only city to experience delays in rail projects. Paris' plan to double its network by building some 200km of new lines took years to be finalised and approved. New York City's Second Avenue Subway project had been planned since 1929, but only got under way in 2007. Excellent piece by Eugene Tay who authored "The 7 Habits of Green Conscious Singaporeans", summarising key values. "7 habits of environmentally conscious people." By Eugene Tay Tse Chuan. The Straits Times Forum, 22 Apr 2013. TODAY, April 22, is Earth Day, which is celebrated globally with activities to remind us to do our part for the environment. But do we still continue this effort after Earth Day? There are seven habits commonly found in people who are environmentally conscious that we can learn from. One, develop a respect for nature, and renew our bond with nature and its biodiversity. Nature has much to teach us on how to live in harmony with other creatures on earth. Without this respect and bond, there will be no desire to protect nature. Start exploring nature areas in Singapore and join guided walks to learn more. Two, read up on local and global environmental issues. What are the current environmental trends and problems? What needs to be done? Make a commitment to learn more about these issues from channels such as websites, books, and newspapers. Three, reduce our environmental impact by taking personal action to reduce energy and water consumption, and waste. Embrace sufficiency in our consumption, and practise the 3Rs - reduce, reuse, and recycle. Four, spread the green message and educate family members, friends, classmates or colleagues. Share your knowledge with them and make use of social media. Influence the organisation that you belong to, whether it is a school, company, or social group, to be more environmentally friendly. Five, participate in government and civil society initiatives for the environment. Support local environmental causes and non-governmental organisations, and join the various activities organised by the groups or volunteer your time with them. Six, participate actively and constructively as citizens in the formulation of government policies on the environment. This could be through government dialogue sessions or feedback channels, and also through the media. Play a part in advocating green causes that you feel strongly about. Seven, make a conscious choice to be a responsible consumer. Buy only what you need and always think twice before buying. Choose more eco-friendly, sustainable, ethical and organic products that are made by sustainable businesses. We can all commit to adopt and practise the seven habits and do our part for the earth."